The internet is good for many things. Selling blue pills, miracle weight cures, dates with attractive foreign ladies who will compliment you for your structure, and making classic cars look great in a brief listing that leaves much to the imagination. And yet, sellers often don’t take advantage of this opportunity, posting pixelated, poorly composed images that don’t tell you much about the car, much less make you feel inspired about what you could do with it. On the other hand, much of that could have something to do with the car, and most classic Jaguars will make the selling photographer’s job easy. 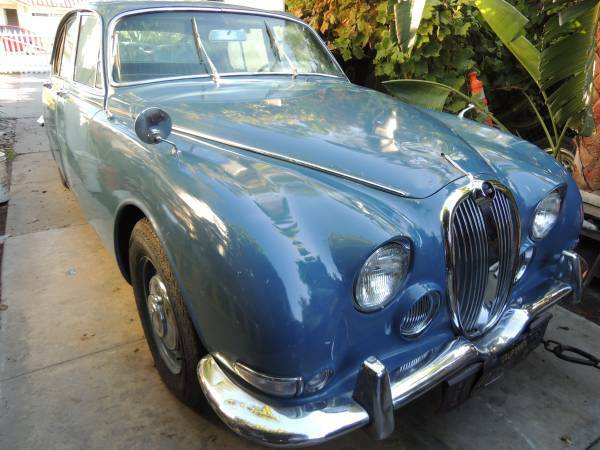 Check out this 1966 Jaguar 3.8 S-Type for sale for a mere $3950 in Costa Mesa, CA. Isn’t she lovely? This medium blue is great on this car, for its own merits as well as for not being the more obvious green, black, or off-white. Let’s see, did we avoid chrome spokes as well? Yes! Do we have a manual transmission? Uhh, check back later. Nonetheless, the teaser given by this first photo suggests you’ll be getting your full money’s worth, with a rust-free, glossy, straight body. Only a bit of surface rust on the right corner of the bumper suggests this car may have been exposed to moisture (likely from the ocean) at some period in its life. Wow, interior looks decent as well. Many older Jaguar sedans at the project level are baked to a crisp, and while this one needs a thorough cleaning and probably a hide feeding, it’s very usable-looking. 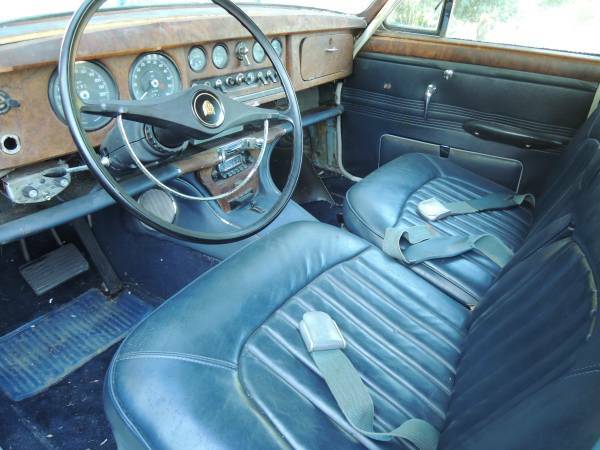 Since the interior is a significant part of the cost of restoring one of these, that’s nothing to shake a stick at. What is that doohickey on the far left? An early radar detector or CB radio? Air conditioning controls as the only remaining trace of a removed system? Here’s the culprit – according to the seller, the car needs mechanical attention or restoration, as the engine is not running. It does appear to need a radiator, and you’ll want to make sure the engine turns so you know it hasn’t been wet for the last 30 years thanks to a cooling failure. 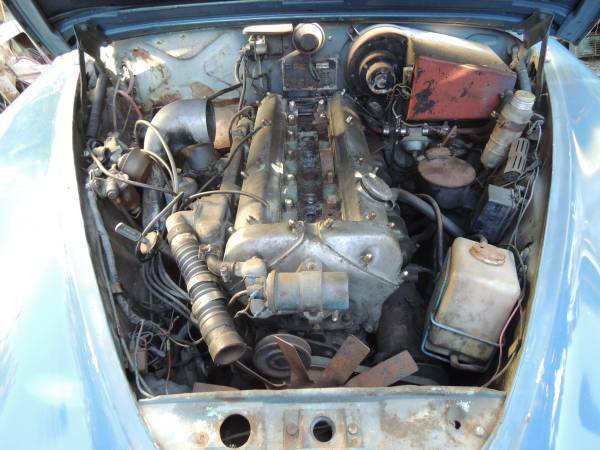 And if everything goes horribly wrong, it should be possible to find an XK engine from an XJ6 or XJ-S in your local junkyard to keep you going until you can source a correct replacement. Here’s the only detail shot in the listing. 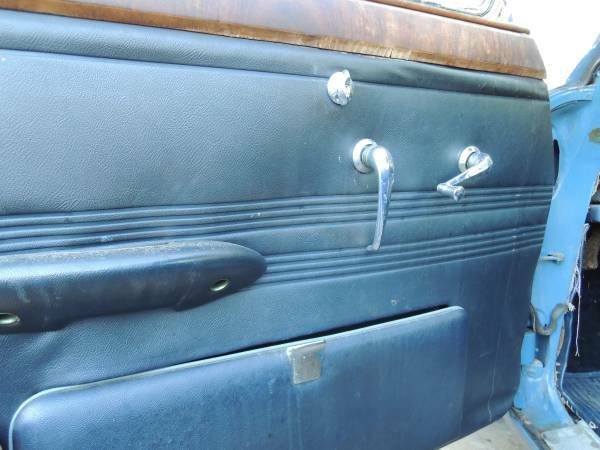 And there are some interesting clues – looks like water has run down over the wood and door panel, the carpet edges look a little ragged, and there is maybe some overspray in the door jamb. But in context, this has the potential to be a decent deal if you’re mechanically and electrically handy. This entry was posted on July 10, 2014 at 4:04 pm and is filed under Feature. You can follow any responses to this entry through the RSS 2.0 feed. You can leave a response, or trackback from your own site.